I had a great time shopping with some of the friends I made from the program. 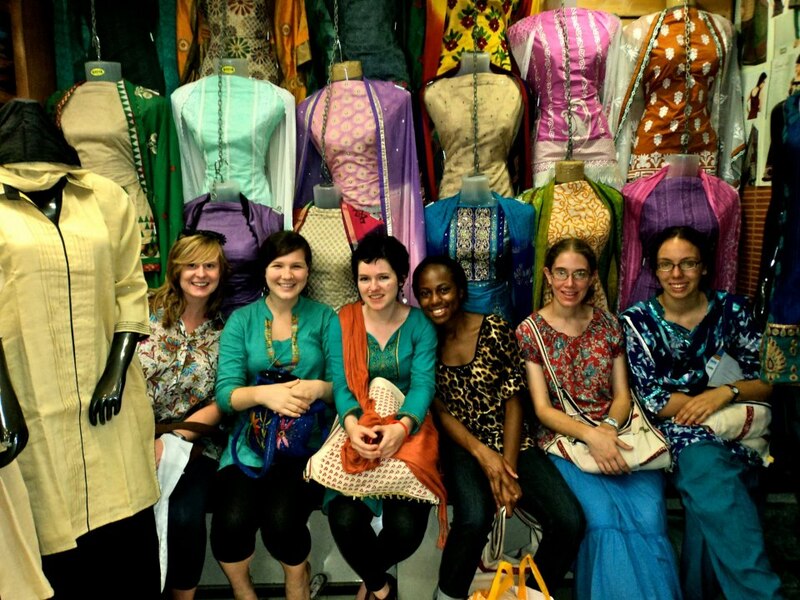 First thing on our to do list was to shop for kurtis, the Indian style long shirt for women. Since we were all foreigners, we had to adhere to conservative dress code to avoid stares and to blend in with the rest of India. But honestly, most of the younger population wore western style clothes unless they were from conservative families, so I didn’t see the point. We stood out like sore thumbs no matter what we wore. Yet, it was fun dressing in a completely different style from what we were used in the U.S. These girls became some of my good friends abroad. We shared stories, cried, laugh, joke, and just hung out occasionally whenever one of us needed to pick up a few essential items. Most of kurtis came in a standard size of large or medium, and we had to have them tailored in order to fit. In the picture we are sitting in front of a bunch of Salwar Kameezes as Lauren and I were waiting for the tailor to finish adjusting the kurtis we bought. Starting with the far left was Brianna, Faith, Lauren, me, Gretchen, and Katie. Back at home I would not have had my clothes tailored, because it would have been somewhat expensive. In some ways, these next few months in India would spoil me. I would occasionally have my clothes tailored, dry clean, a cleaning maid for the hostel, and a person who picked up trash at our doorstep.